Sometimes in stock but normally made to order in a few weeks. Knobsticks exhibit a large degree of variation depending on the size and shape of the original branch and angle of attachment where the shaft grows. We never cut very many of these as they are so difficult to find. 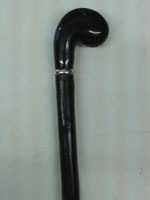 Length required See notes MAXIMUM 36"
Turned Hardwood Knobstick Not often in stock but made to order in a few weeks. 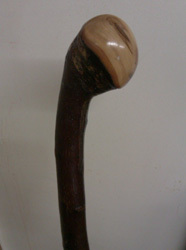 Handle formed on a lathe and joined to a natural or turned shank.